I wanted to quit my business. A few months after my daughter was born, I was struggling with the demands of nurturing a newborn and growing a coaching business. I wanted to devote my heart, time, and energy into my passions: to develop a relationship with my daughter and to help my clients grow their confidence and their business. The problem was, I was trying to do the SAME amount of work on my business as I did BEFORE the baby while adding the motherhood learning curve of breastfeeding, sleep training, and bonding with my child on top of it. No wonder I wanted to throw in the towel on the whole business thing. I had to do a reality check and redefine my priorities according the this new season of life I found myself in. Once I realized that during this short time, I wanted to GROW a foundation for my family first while maintaining my momentum for my business, that gave me the permission to create a business and life that worked for me. So I wanted to share with you a simple and powerful exercise to help you figure out your priorities for this season of life and business. In a world where your roles, responsibilities, and demands are constantly changing, it’s helpful to set intentions in how you want to focus your precious time and energy. Maybe you find yourself trying to balance a baby and a business like me, or maybe you’re feeling led to put your health first, or figure out how to become financially free. Wherever you are, know that you don’t have to do it all, or do it all right now. Getting clear on your priorities, in terms of figuring out what you want to CHANGE to grow will help you feel more focused and less stressed. 1. Evaluate how you’re doing in each of the life categories on a scale from 1-10. (1 is “rock bottom, something has to change drastically and NOW!, 10 is I’m content and this is awesome!) No need to overthink it, and your scale is personal to you, but this can help you determine how you’re *really* doing in each area. * Note: you can edit or add to these life categories as you see fit! For example, you may have a day job AND a business, so you’ll want to separate those. 2. Next, jot down what comes to mind for you in each of these areas and ideas of how you’d like to improve. The purpose of this is to capture how you’re doing in each area so you can get a better sense of your life as a whole. * I’d like to eat less sugar and move my body more. * Going to yoga on Fridays has been really enjoyable. Again, we’re just capturing details so it’s better just to be honest! 3. Pick 3 areas of your life to focus on as your PRIORITIES! Ask yourself: which 3 areas would I like to focus my energy on CHANGING? I like to use the “ABC” method and assign each category a letter according to priority. “A” priority means I want to focus my energy on CHANGING this area, by cultivating a new habit, learning new tools, letting go of things that don’t serve me, and growing! “C” priority means I can maintain this area and be okay! Having “C” priorities recognizes that you have a finite amount of time, energy, and resources, and it’s OK not to do everything! Plus, you probably have areas of your life that’s going well so it’s okay maintain what you’re doing. 4. Get clear on “How” you’ll work on your priorities. What are the first steps you want to take to get started on your goals? How will you keep yourself accountable to keep these priorities? What can you schedule into your calendar so you know WHEN you’ll do these things? Here’s where change starts to happen so it’s important to be clear on your intentions and make room in your schedule for it! Once you have clarity on what you’d like to focus on FOR THIS SEASON of your life and business (I like to do this exercise annually, and tweak it if necessary every 3 months), you’ll have the permission to NOT do it all. Instead, you can focus on a few key areas that will make a BIG impact on your life. As an entrepreneur (and human being), your time is VALUABLE, and is the only resource that you can never get back! One of the big obstacles and excuses that I hear from my clients and fellow female founders is "I don't have TIME!" Well, my friend, if you have the dream, then I'm here to help you MAKE the time to follow through on those brilliant ideas I know you have. This week, we'll take an honest look at how you are ACTUALLY spending your time in regards to working ON and working IN the business can give us insight into how you can make changes to be more productive so you can do what’s most important to you. This will also help lay the groundwork to give you data if you'd like to invest in online tools, or even hire team members. 1. First, let's start with doing a time audit. You know how whenever you want to start keeping a budget, you first start with tracking your finances? Or how my nutritionist wanted me to track everything I ate for a week to see just how much sugar I was consuming? You can do the same thing with your time. By tracking how you spend your time, you’ll get a baseline look on your habits and workflow, so you can honestly evaluate what’s working and not working. No judgment here, just simple reporting! You can do it in a paper planner, in an excel spreadsheet, or an online tool like Toggl. Did you know that there are different types of activities? Meaning, there are some tasks that only you can do as a CEO/service provider that are worth more than other tasks that you could outsource or even delete. Here's where you can start to categorize your tasks according to how much this activity is worth your time. For example, "CEO time" spent creating your unique brand position will ultimately help you bring in more money than changing the font on your web site. So, here's a general category list that I like to use to break down the type of tasks I do. Since I'm nerdy, I like to color code them as well. Money-Making (green), Customer Service/Client Calls (blue), Planning & Strategy (purple), Admin (red), Personal (pink). Then, assign each category a $$ amount, generally in terms of what you get paid v. what you can pay someone to do. 3. After a week of time tracking, reflect on how you're spending your time. What are my priorities, and are they scheduled FIRST into my calendar? Your values are important to taking the TIME to express them will make a difference in your fulfillment. What are activities that you don't enjoy and you're not good at? If it's business related and NOT necessary, then say good-bye! If it's business related and necessary, then this could be a task you automate with a tool, or a team member you hire. For example, let's say you don't enjoy scheduling your social media, but using a tool like Hootsuite will save you time, or hiring a social media manager who helps you to create, post, and engage may be an option for you. What activities can I batch together? Sometimes a great time saver is to do "like" activities all together so you don't have to interrupt your brain flow (which can really hurt your productivity and efficiency!) Even things like meal plan and prep for the week or batching your content for the month can all be done in one sitting. 4. If you have team members or support people, delegate those lower-income tasks, or streamline your process to make it a simple process. After tracking and reflection, you can then begin to implement small changes to your schedule to see it's a more effective use of your time. Of course, don't forget to block off PERSONAL TIME and make it a non-negotiable so you have work/life balance and boundaries in place as well. Track how you currently spend your time by creating a "time audit." What are some insights you have from this? What would you like to change? Join the Authentic Brand Leaders Facebook group, and let us know all about it! If you found this letter helpful, then please share it with your friends! Or, you can subscribe to the "Letters For Leaders" emails for more tips, strategies, and coaching exercises delivered right to your inbox. Sign up below! I had my quarter-life crisis at age 24. Don’t get me wrong, things on the outside looked great. I was newly married, living an adventurous lifestyle abroad in Beijing, China, and landed a dream job teaching at an international school. But things on the inside weren’t so dreamy. I was struggling with the paradox of passion. If I’m passionate about teaching, then how come I’m frustrated with my job? If I’m meant to mentor others, then how come I can’t seem to find those opportunities? If I’m here for a reason, then why can’t I create a well-integrated, passionate life? If I could go back and tell my 24-year-old self one thing, it would be this: Passion is working towards living out your Purpose. It’s up to you to be intentional with it. There’s a lot of not-so-helpful tips about Passion out there. “Do what you love, and you’ll never work a day in your life.” “You only live once!” The essence of these mantras are to inspire you to do great things. But if we’re not careful, we can struggle with Passion as we strive to chase it, rather than create it. 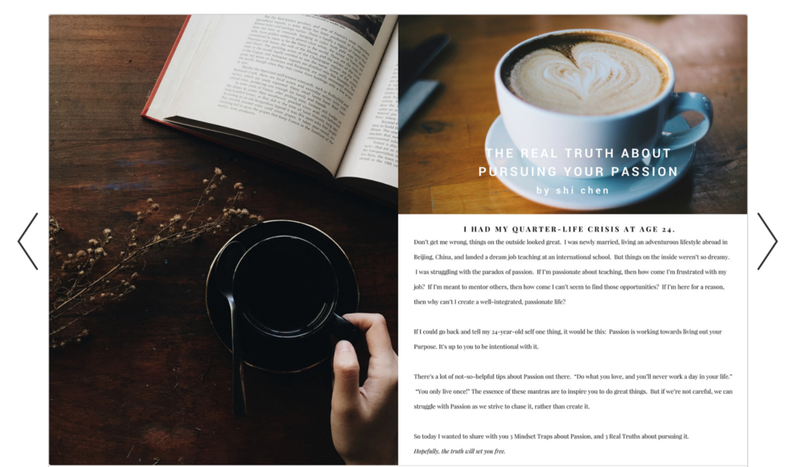 So today I wanted to share with you 3 Lies about Passion, and 3 Real Truths about pursuing it. Hopefully, the truth will set you free. People get tripped up with this misconception because they associate their work with something that should fulfill their ultimate purpose. The thing is, work is WORK. People freak out when they can’t see the connection between where they are now, and where they’d like to be. Your career and your business has different seasons. It comes with challenges and opportunities for growth. Putting your focus on things beyond your control, like circumstances, job title and description and where you can lose motivation. Instead, you have it within your control to do the self-discovery work of identifying your passion, even if it’s just for the short-term.. Ask yourself: what’s important to me in order to create great work? What’s my purpose for this season of my career? What strengths do I have to offer to make a meaningful contribution? Passion can consist of your gifts, your strengths, and your purpose, so when you can pinpoint these components, it’s easier to create opportunities to pursue them. Passion starts with your attitude, your work ethic, and your outlook on creating positive outcomes so your initial passion can multiply into even more passion. For me, it was easy to lose sight of the big picture of helping these young kids grow their minds, confidence, and skills when I was caught up in the student drama, difficult conversations with parents, and administrative work. Once I realized that my teaching job is equipping me with the leadership skills of communication, creation and execution, and working with different types of people (that would prepare me for whatever was next), I could engage better in all aspects of my work and infuse passion into everything I do. The Truth is: Pursuing your passion means you can be intentional about bringing passion into your work, instead of relying on your work to bring you passion. The problem with this mentality is thinking passion = joy. But the real definition of passion is doing something that’s bigger than yourself. When you’re committed to doing something that really matters, like finally stepping out in faith to follow your dreams, go against the norm, or stand up for what you believe in, you’ll start to experience a bit of fear and resistance. Change is tough -- and you could be mistaking those challenges and obstacles for a lack a passion. For example, you will encounter self-doubt, people who naysay and don’t understand your vision, and things that won’t go as you expected. Yes, pursuing your passion CAN be easy and fun, once you’ve learned to embrace your fears, face the resistance, and do what you set out to do anyways. During my teacher years, I noticed that I have a natural affinity for educating kids, but even more so, for mentoring and coaching emerging teachers. As a young professional myself, who was I to teach best industry practices? But when I recognized my desire to help other teachers with professional development, I had to face my fear of caring what others think, fear of failure, and a bit of fear of success in order to create a series of workshops, team building meetings, and one-on-one mentoring relationships. Truth: Pursuing your passion comes with learning to embrace your fears and face any resistance. It’s certainly a noble goal to turn your passion into profit, but it’s a personal choice. There are many business owners who got to where they are today because they were good at something, helped people, and figured out a way to make it into their full-time living. That’s what happened to me. I got bit by the coaching and mentoring bug and wanted nothing more than to coach as as many people as possible. The thing to keep in mind is: there’s a difference between being a passionate creative/service provider and being a savvy business owner. Meaning, I am a great coach but being a great boss lady requires a different skill set. One that includes marketing, selling, product development, management, etc. So, if you’re passionate about something, you get to choose whether or not you want to go through the learning curve of business building, or just keep it as a creative outlet. Both are fine choices. Truth: Turning your passion into profit is a personal choice. There’s a difference between being a passionate creative and a savvy business owner. When you pursue your passion, it’s important to recognize the hard work, the fear and the resistance, and the learning curve of new skills in order to continue to do work that matters and live a life of contribution and purpose. The truth is: passion starts with who you are, where you are. You have the choice and the ability to infuse it into everything you do. If you're working on turning your passion into profit, then my 1:1 3-month "From Calling to Clients" business coaching package will help you lay a solid and sustainable foundation for your business. Apply for a discovery call today to chat about if this is the right opportunity for you to receive the support to reach your BIG business goals. [Featured] How has accountability partners positively impacted your business?